Hiring? Toptal handpicks top Ionic developers to suit your needs. Scrum Master Julien (MCS) is a front-end mobile dev who's worked for startups and enterprises like eBay, and even the French space agency. The Ionic project is rapidly gaining in popularity. With more than 27,000 stars on GitHub, it has risen to become one of the top 50 most popular open source projects worldwide. And since the stable version of Ionic 2 was recently announced, it’s the perfect time for engineers to analyze and understand the differences between Ionic 2 and Ionic 1. At a high level, Ionic 2 is a complete rewrite of the Ionic 1 project with Angular >= 2.x. 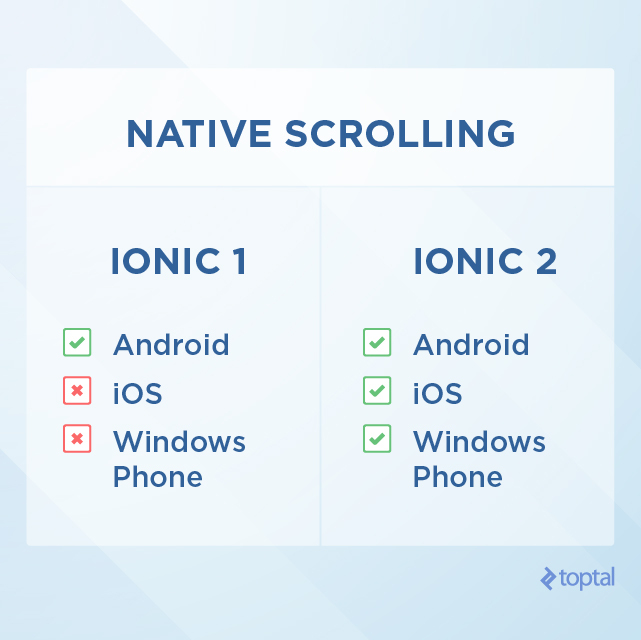 From my 2+ years of experience using Ionic 1, here’s what this will mean in practical terms. 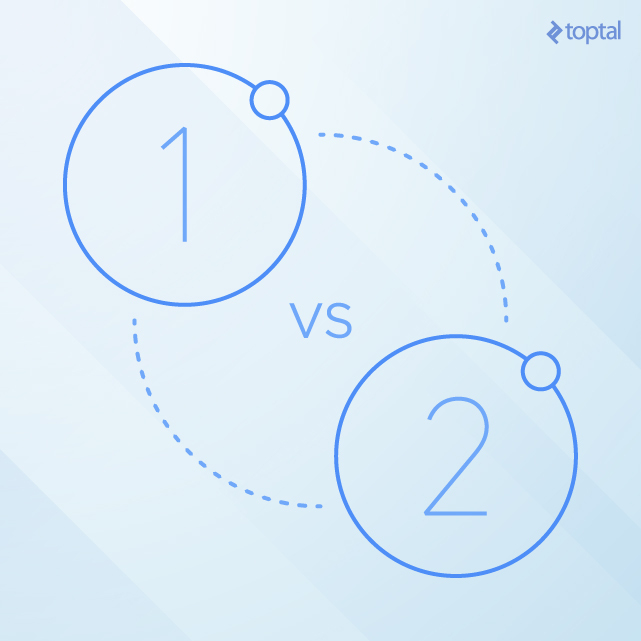 Ionic 1 is based on Angular 1.x, and Ionic 2 is based on Angular >= 2.x. 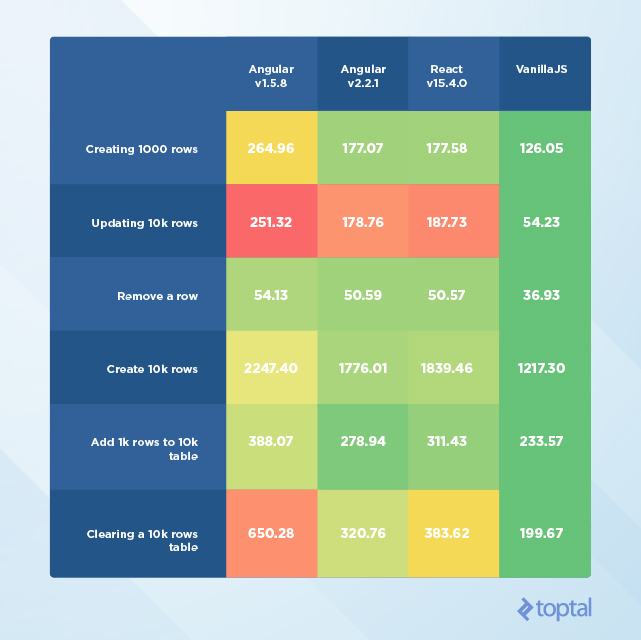 The performance boost you get just by using Angular >= 2.x alone is significant. With Angular 1.x, to get performant applications required a lot of deep framework knowledge (like $watch, One-time binding, and so on). With Angular >= 2.,x applications are pretty much performant out of the box. The new version of Angular dropped the famous and decried digest cycle (tracking and testing every variable of the app at every change). Instead, Angular >= 2.x relies on Zone.js to track application changes (both synchronous and asynchronous). Change Detection in Angular >= 2.x is worth exploring to understand how things work under the hood. In Angular >= 2.x, change detection is always performed from top to bottom. Using the right change detection strategy (OnPush or Default) in your own components is of paramount importance if you want to control the performance of your application. All Ionic 2 components use the OnPush strategy, meaning the change detection is not performed all the time but, instead, only when the inputs change. This strategy also avoids unnecessary rendering of components’ subtrees. It is basically already optimized for you. If you want to know more about how to get a performant Ionic1 application, I suggest reading this Ultimate AngularJS and Ionic performance cheat sheet. Ionic 2, once again, benefits from this performance upgrade, and does so “for free”. Ionic 1 and Ionic 2 still rely on CSS animations for internal transitions and animations, but as Ionic 2 is based on Angular >= 2.x, developers have access to the new Web Animations (W3C) API via the Angular animation system. The Angular >= 2.x animation API lets you easily describe complex animations (entering and leaving from different states or group animations) and gives you access to animations lifecycle via callbacks. Native scrolling support brings better performance and improves the user experience by helping to ensure a smooth scroll thanks to asynchronous events. As you can see, if you are familiar with the Ionic 1 component API, you will feel comfortable using Ionic 2 components as well. You’ll just need to be aware of these differences. With an impressive list of components, everything that you can do with Ionic 1 is doable with Ionic 2, and even more. Traditionally, all frameworks were built on top of, and relied on, the window and document objects. However, in workers neither are available. With the new Angular >=2 architecture that decoupled the renderer, running the application within Web Workers (or any other platform for that matter) is made easier. Ionic 2 is starting to experiment with the use of Web Workers with the new ion-img component. For now, ion-img can only be used within a VirtualScroll list. It delegates the image HTTP call to the Web Workers, and also supports lazy loading (i.e., only retrieve and render images on the viewport). Your web application now only focuses on the UI and lets the workers do the rest. Keep in mind that this is only the beginning and that we expect to see more usage or Web Workers in the near future. We use an Interface (IPresident) that describes the president Object shape. It is interesting to have interfaces describing what you are manipulating, especially if there are several developers on a project. If you make a mistake and, for instance, use a boolean for the president name, your IDE will tell you that something is wrong even before the compilation happens. In virtually any IDE you use (Visual Studio Code, Atom, WebStorm, or the like), you will find plugins to enable autocomplete, type checking, and a linter. TypeScript is a real advantage for Ionic 2, as it makes your code more understandable, helps you avoid type mistakes, and helps you be more productive (through features like autocomplete, auto import of modules, tooltip definitions on hover, and CTRL + Click to go to definitions). The Ionic CLI v2 adds a way to generate Pages, Components, Pipes, and Directives, directly via the command line. An HTML file for your template. A SASS file for your component style. A TypeScript file for your component logic. Enforcing conventions via use of the CLI is great when you work on a team. Angular 2.x and Ionic 2 are doing a great job of helping foster a better understanding of what an Angular app architecture should be. Of course, you are free to diverge from the conventions, if you want to. Ionic 1 relies on the Gulp ecosystem to bundle applications, while Ionic 2 lets you select your favorite tools. Ionic 2 provides its own collection of tools as a separated project: ionic-app-scripts. The ionic-app-scripts is based on the idea that developers should not worry about packaging configuration at all. The only packaging related dependency that your project will have with Ionic 2 is @ionic/app-scripts. By default, it uses Webpack but you can use Rollup as well. With Ionic 2 and the CLI v2, the assets, as well as the TypeScript files, live in the same src folder. The www is now generated during every build and therefore should be removed from version control tracking. Being notified about runtime errors as soon as possible during development is incredibly valuable and Ionic 2 has done a great job in this regard. Ahead of Time Compilation (AoT) is a little revolution in the Angular ecosystem. Introduced with Angular 2.x, AoT allows for templates to be pre-compiled in a build step, instead of being compiled on-the-fly by the browser. While this may not seem like a big difference, it actually is. With AoT, we do not have to ship the template compiler with the application. This has two advantages. First, the bundle will be smaller, which directly impacts the network and therefore makes your application faster to download. Second, the app will bootstrap faster because template compilation on-the-fly is no longer necessary. Ionic 2 takes full advantage of Angular 2.x AoT to optimize the size and loading time of your application for free. Overall, Ionic 2 is a huge step forward for the hybrid mobile industry. Although the set of Ionic 2 components is similar to Ionic 1 components, Ionic 2 offers a lot of tools and performance improvement. Indeed, with tools such as TypeScript, ionic-app-scripts and Ionic CLI, Ionic 2 developers can be more productive, can produce more maintainable code, and are alerted to runtime errors as soon as they happen. Ionic 2 also provides a free performance boost relative to Ionic 1, in particular by eliminating or reducing its bottlenecks (related to change detection, animations, loading time, and so on). With Ionic 2, your applications will feel more native than ever. Take it out for a spin. You’ll be glad you did. Hello, do you experience that even after AoT compilation? Yes... ionic build android --prod --aot i crealy saw "ngc" running. Without AOT its 2 seconds longer. ok, the biggest project I have with Ionic 2 is https://github.com/shprink/wordpress-hybrid-client/tree/v3 and has only 10 pages or so. I have not tested on old android phones though. I wished to try it but it seem a very custom configuration and not the default one created by the ionic cli. the Ionic 2 version (under dev, AppID: f2dbe26f for ionic view) is based on CLI v2 but not the Ionic 1 version because I use more or less v2 architecture on a v1 project. There should be a mention of React Native and NativeBase.io in the article as a comparison too. Cool! Is it possible to use Ionic 2 with React instead Angular 2? Not possible. Angular 2 is really cool, you will love it. never stop, ionic 3 is coming! what can ionic2 that react-native has a hard time doing? and vice versa? I am an OK developer, good enough to get the job done but an expert programmer would probably tear my app apart. As such, upgrading my environments petrifies me. Between NodeJS, Cordova, Ionic, all the cordova plugins, let alone Android Studio and iOS Xcode (the WORST) - any time something changes and I am forced to update that component it usually causes a cascade of other failures that force more updates usually only exasperating the problem. Thus my app is still on Ionic v1. It works perfectly...don't fix what ain't broken right? But I know its time (beyond time) to update to v2 or even go straight to v3. But my question is this: what is going to break? How much recoding will I have to do? Is all the functionality of v1 preserved in v2/v3 or are many components changed or obsolete now - if so, is there a master list someone can refer me to? When moving to v2/v3 I am assuming all the AngularJS gets updated to the latest versions too - so the same questions apply, what features have changed or are obsolete that I will need to recode? Should I step through from v1 -> v2 -> v3....or just go straight from v1 -> v3. I have been running, successfully, on v1 for so long now I am pretty afraid of all the things that will break and have to be recoded - and the time it will take to learn the new features and techniques. I just posted my fears above. I too am still on on Ionic v1 and am dreading the move to v2 or v3 - afraid of all the things that will break and the amount of time its going to take to fix it all. How did your switch to v2 go? What pains did you encounter...what v1 features broke after the update? Any insights to prepare me for the slaughter will be much appreciated. in a few seconds Amazing to your experience, How to make compatable with most language ?. Just came across this article. Pretty neat. In my opinion, there should be separate articles for each of the points discussed above, such as the CLI, AoT, etc.